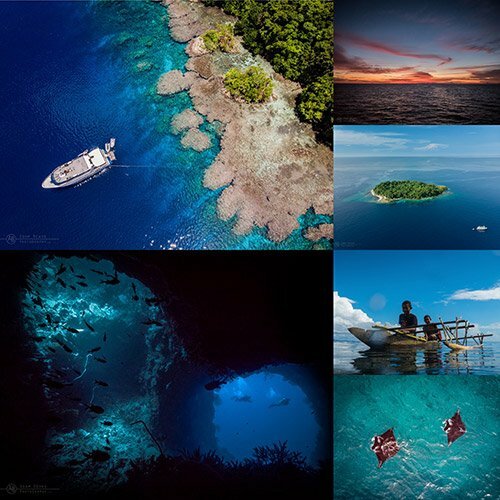 On this Special Master Liveaboards Trip to the Best of Solomon island, Gerald Rambert will be at your disposal to help you improve your underwater photography skills, such as macro, wide angle, compact and SLR photography. He will be conveying tips and tricks to you based on his vast experience as a professional. Recognising that each person’s camera is a different make and model, Gerald usually spends the first two days of the trip assisting every guest with camera set up, fine-tuning settings and finding the best compromise for achieving optimum results. In between dives, Gerald sits with guests to review photos and discuss techniques for improvements on an individual or group basis depending on the group and camera types involved. Moreover, Gerald will accompany each guest underwater in order to indicate the best way to approach a subject and set the camera to capture the best image. By doing so, guests can pick up skills at their own pace, while Gerald can provide tips and feedback to each guest individually. Seascapes in the Solomons are perfect for wide angle shots, while macro lovers will also get their share to practice with; ghost pipefish, leaf fish, nudibranchs, etc. There is plenty for photographers of all specialties! Solomon Islands comprise 992 islands, of which only 147 are inhabited. Situated to the southeast of Papua New Guinea, Solomon Islands are one of the most peaceful and beautiful areas of the Pacific. They also have some of the most pristine dive sites in the world. These are filled with innumerable unspoiled hard and soft corals because of the remote location and the limited number of divers. Indulge yourself exclusively in diving with pilot whales, various kinds of sharks, mantas and huge shoals of fish, right down to the macro wonders such as pygmy sea horses, nudibranchs and ghost pipefish. The marine diversity in Solomon Islands is hard to beat! Solomon Islands are THE destination for the real diving fan looking for a change of scenery, completely off the beaten track. You will also find: wrecks, caverns, wide-angle reefs and large sea fans. Solomon Islands rival any other Indo-Pacific dive travel destination for coral reefs, marine life and diversity but without the tourist numbers. Solomons PNG Master is a custom designed diving vessel with 12 cabins accommodating up to 20 guests and a crew of 12 including your dive team, skipper, boat crew and chefs. Inside she boasts a huge lounge and dining area with DVDs, large TVs and a dedicated camera area for our photographer guests. Spend time sharing your photos from your dive adventures, reading a book from our library or just chill out in air conditioned comfort. The Solomons PNG Master embarks and disembarks for Solomon cruises in Honiara. Book your international flight into and out of Honiara International Airport (HIR). There are daily domestic flights to Munda (MUA) for those itineraries that require it. Our representative will meet you at the airport. Embarkation time is 18:00pm; disembarkation at the end of the cruise will be 9:00am. International flights are possible to most destinations on the day of disembarkation but please ensure you allow plenty of time for transfers and check in. Visa rules and requirements are in a constant state of flux. ‘Visas on arrival’ are often limited to airports and are not given out in seaports. With this in mind, we kindly urge our guests to secure the visas for both countries prior to departure from home in order to avoid any visa issues during the cruise. On arrival…. Passport holders of most Western and Asian countries will be issued with a visitors permit on arrival into Solomon Islands that allows for stays of up to 90 days, please make sure that your passport has validity of at least 6 months beyond the period you intend to stay in Solomon Islands. If you are travelling with medication please bring your physician’s prescription with you. Check http://www.visitsolomons.com.sb for further information. Staying there… The local currency is the Solomon Islands Dollar (SBD). Exchange services are available, including at Honiara International Airport. Larger hotels, resorts, shops and restaurants may accept Visa and Mastercard for which a charge will likely be levied, but not all so always check first. We work with a number of hotels and resorts and so should you wish to extend your stay in Solomon Islands, the Worldwide Dive and Sail travel team will be pleased to assist you. Climate and weather… Solomon Islands have an equatorial climate and weather is roughly divided into two seasons. There is more rainfall from November to April, however, the area is not monsoonal and so poor weather usually blows through very quickly. Temperature changes only very slightly throughout the year with the average daytime temperature being around 27°C (81°F). While evenings are generally also quite warm we would always advise guests to bring warm clothing for the cooler evenings just in case. Time zone… The local time in Solomon Islands is 11 hours ahead of UTC (GMT). Health… Generally, medical care in Solomon Islands is very basic and medical supplies are limited. There are around 8 hospitals, of which the best one is the National Referral Hospital located in Honiara. Moreover, a few church-funded medical facilities, nurse-stations and the like can be found on several islands. In order to prevent stomach ailments we recommend travelers to follow normal precautions with food and drink bottled water only. Please make sure you use insect repellent and cover exposed skin to prevent any insect borne diseases. Malaria is present, as are other tropical diseases such as dengue, TB, hepatitis, and typhoid. We recommend consulting your doctor or nearest health care professional for up-to-date medical travel information and vaccinations well before departure. Please note: Some malaria prevention medications including mefloquine (brand name Lariam) have side effects which can mimic decompression sickness. Master Liveboard strongly advise that tier guests plan to stay in the Solomon Islands one night before and also preferably one night after their cruise if possible. We find that this reduces potential problems created by delays and schedule changes in international flights. It also allows the guests to begin their cruise rested and relaxed. Master Liveaboards maintains working relations with travel agents, resorts and tour operators within the Solomon Islands and so are well suited to assist with the organisation of domestic flights, transfers, excursions and accommodation before and/or after the cruise. Please let us know if you would like me to manage any of these aspects on your behalf. Here are some useful links for this trip.